More than 4,000 acres of open use area is located in the main valley on either side of Gold Hill Road and along Hungry Valley Road. This area contains a mix of designated trails and unmarked trails that traverse a variety of terrain from sand washes, to rolling hills, to hill climbs. 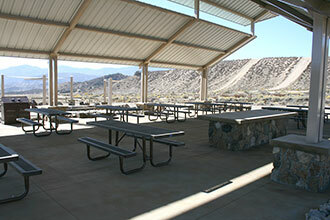 Hungry Valley has approximately 170 campsites throughout the park. Located adjacent to Gold Hill Road and Hungry Valley Road are nine semi-developed campgrounds which provide shade ramadas, picnic tables, fire rings, vault restrooms and trash bins. Smith Forks campground also provides a mini track for young riders to recreate under the watchful eye of their parents. Due to the arid environment, drinking water is not available anywhere in the park. Located in the heart of Hungry Valley SVRA with spectacular panoramic views of the surrounding mountains, Hungry Valley Pavilion and Group Camp is a wonderful venue for hosting special events of all kinds including club gatherings, weddings, group camping, business and professional groups, charity events, organized trail rides, and reunions. The facility offers a large centralized group area containing an amphitheater complete with seating, a stage, and a campfire ring. A large ranch style barbecue pit is available for cooking as are food preparation tables, smaller barbeque pits, a large group shade ramada, picnic tables, and restroom facilities. 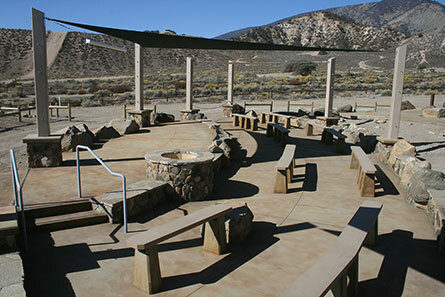 Hungry Valley Pavilion and Group Camp is also host to Hungry Valley SVRA-sponsored interpretive programs including campfires and slide shows which are free to the public. In addition to the centralized group area, there are smaller group camping areas around the perimeter of the facility complete with their own picnic tables, shade ramadas, and fire rings. The area offers plenty of space for overnight camping, trailers, and tents. The Hungry Valley Pavilion and Group Camp is available by reservation for day use and overnight stays. Please contact the District Office at 661-248-7007 for additional information or to make a reservation. Fort Tejon State Historical Park offers group camping for 25 to 50 persons. Sites have drinking water and restrooms. Reservation can be made through MISTIX (800) 444-7275. The area surrounding Hungry Valley SVRA is administered by the Angeles and Los Padres National Forests. Campgrounds in the Los Padres National Forest include McGill, Mt. Pinos, Chula Vista, Pine Springs, Thorn Meadows, and Kings. For information on these camping areas call the Mt. Pinos Ranger District at (661) 245-3731. 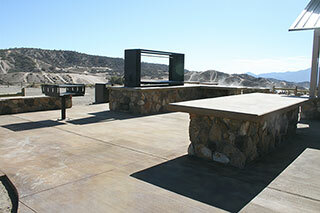 Campgrounds in the Angeles National Forest include: Los Alamos, Saw Mill, Cottonwood, Cienega, Zuni, and Oak Flat. 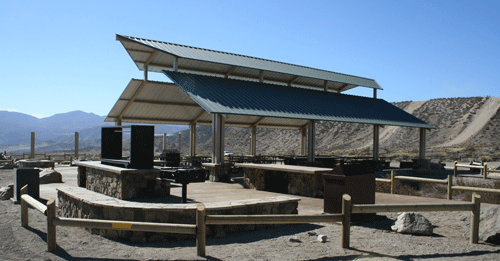 For information on these camping areas call the Saugus Ranger District at (661) 296-9710. Remember to check weather conditions!